Ch'p first appeared in Green Lantern vol. 2 #148 was created by Paul Kupperberg and Don Newton. Ch'p's early history was recounted in Green Lantern Corps #203. A native of the planet H'lven, he participated in the defense of his homeworld from an invasion by the Crabster army of Doctor Ub'x. He was captured and sentenced to death, but one of the Guardians of the Universe came secretly to induct him into the Corps with the power ring of his predecessor, who had fallen attempting to stop the invasion. Using the ring, Ch'p was able to defeat Doctor Ub'x and free his world. Shortly afterward he travelled to Oa where he was instructed by Kilowog in the same group of recruits as Hal Jordan. Ch'p went on to become the Green Lantern of sector 1014, and became good friends with Jordan, Mogo, Salaak and other members of the Green Lantern Corps. Ch'p maintained a secret identity on H'lven until he married his longtime girlfriend M'nn'e. While not serving the Guardians on Oa, Ch'p defended H'lven from various threats, many of them engineered by his old nemesis Doctor Ub'x. Ch'p's history as a Green Lantern was fairly typical until his participation in the Crisis on Infinite Earths. Since the crisis had affected the entire universe, it was thus also a Crisis on Infinite H'lvens, and when he returned to his home, he discovered that history had been rewritten so that he had died in an accident fifteen years earlier. In the new timeline, his wife M'nn'e had remarried his best friend, D'll. Stunned and disheartened, Ch'p abandoned H'lven for Earth, where he served with the team of Green Lanterns that were assigned to safeguard the planet. Unlike the rest of the universe, the members of the Corps were able to recall pre-Crisis events. They were thus the only people who recalled the Green Lantern from H'lven. During this period, Ch'p once again battled Doctor Ub'x, the only other person from H'lven who recalled the pre-Crisis timeline. The two adversaries eventually realized the important connection they shared and set aside their differences. Ch'p's experiences on Earth were primarily negative, such as his shocked realization that his Earthly counterparts were non-sapient animals, so he eventually returned to H'lven to start over. When the power battery on Oa was destroyed following the execution of Sinestro, Ch'p's ring was one of the few that still functioned. The strain of living on a world where nobody remembered him led to depression and a suicide attempt that was halted by his fellow Green Lantern, Salaak, who became Ch'p's advisor and friend on H'lven. The two friends later travelled to Oa to participate in the reconstruction of the Green Lantern Corps. Ch'p was assigned to patrol Oa, specifically the makeshift city called Mosaic World. There he teams up with John Stewart who is under the subtle influence of Sinestro. A yellow tractor-trailer hits and kills Ch'p. An image of the deceased Ch'p occasionally appears to the Green Lantern John Stewart, although the exact nature of the apparition was never fully explained. When the Corps was refounded following the defeat of Parallax, another native of H'lven, B'dg, was selected as the new Green Lantern of sector 1014. Ch'p has appeared in numerous ways since his death. He is shown in an Alex Ross painting of the Green Lantern Corps; and in one of the last Kyle Rayner Green Lantern stories, where Kyle visits his sector. In an issue of the DC comic 52, the character Ambush Bug is shown enjoying a snack food called "Ch'ps" that apparently has a certain space squirrel as a mascot. Ch'p also appeared in a flashback story in the current Green Lantern series (#31) training in the same class as Hal Jordan. Ch'p is one of the many fallen Lanterns to be risen from his grave on Oa to become a Black Lantern. He is one of the many Black Lanterns beginning a stand against the living Green Lanterns on Oa. The re-animated Ch'p is destroyed by Guy Gardner wielding Red and Green power rings. In DC Super Friends #14, Ch'p is called in when the Super Friends are immobilized by Kanjar Ro. Realizing that only humans are affected by the immobilizing effect, John Stewart summons Ch'p to Earth. 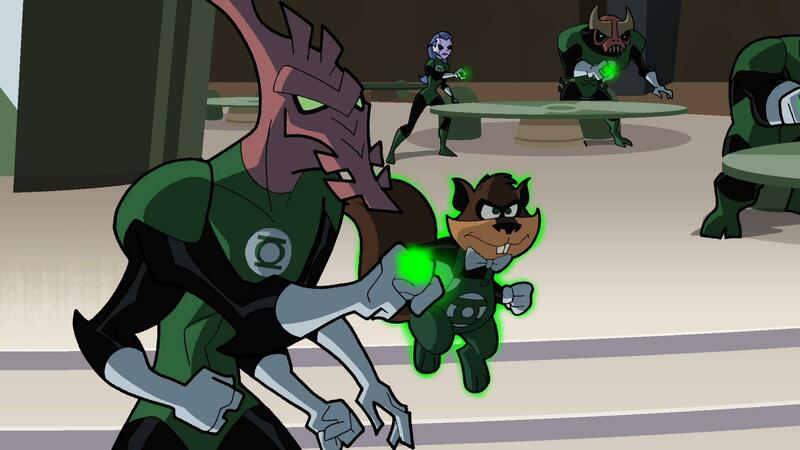 The squirrel-like Green Lantern then leads a version of the Legion of Super-Pets, (although he is quick to assert that he himself is not a pet) including Krypto, Streaky, Beppo, Ace the Bat Hound, a super-powered Octopus, and Jumpa an Amazonian kangaroo, in a mission to free the planet from Kanjar Ro's evil plot. Ch'p also appears in Tiny Titans #25. He also appears in early promotional material for Tiny Titans #28 as a member of the Super Pets, but the character was replaced at the last minute by his successor, B'dg. He appears in the alternate reality comic JLA: Another Nail as a member of the Corps strike force attacking Apokolips. He appears with other Green Lantern Corps members in the final issue of Justice, responding to a call for help from Hal Jordan. He has a non-speaking role in an issue of the comic book version of Batman: The Brave and the Bold, where he is depicted using his signature acorn attack. A statue of Ch'p stands alongside those of other prominent Green Lanterns on the planet Oa of the 31st Century in the miniseries Final Crisis: Legion of 3 Worlds. In the alternate world comic book Injustice: Gods Among Us, Ch'p is part of a Green Lantern team sent to capture Superman. He defeats Superman by scrambling the Man of Steel's neurons, but the Green Lantern squirrel is killed by Sinestro before he can complete his mission. A version of Ch'p was seen on the Duck Dodgers episode "The Green Loontern" with his squirrel-like chatterings provided by Frank Welker. Dodgers sarcastically refers to him as "Alvin". Ch'p has made several cameos on Batman: The Brave and the Bold: in the teaser of Day of the Dark Knight, in The Eyes of Despero and in both episodes of the two-part Siege of Starro. Ch'p appears as a Lantern recruit, under the tutelage of Kilowog, in the second arc of Green Lantern: The Animated Series. He is Kilowog's choice to spar with Hal Jordan as the result of a wager between the two: if Hal can beat Kilowog's top recruit, Kilowog will accompany Hal on a mission. Ch'p delivers a resounding and comedic trashing to Hal. Kilowog reveals he was planning on going anyway, but that he "just wanted to see Hal fight the squirrel." He later assists Hal in rescuing Aya from the Guardians' labs, where she is about to be dissected. Slipping into the lab while Hal distracts Chaselon, Ch'p switches Aya's memory core with that of her replacement, allowing Hal to upload her into his ship, the "Interceptor". By the time of the Battle of Ranx, Ch'p has been given a senior position in the Corps. He is one of the squadron leaders consulted by Guy Gardner after the first attack upon the Manhunters. In the series finale, he saves Guy Gardner by expertly decapitating a Manhunter, much to Gardner's surprise. Ch'p is not mentioned by name in the series, but his home sector is identified as 1014, which is consistent with the comic books. Ch'p appears alongside various other Green Lanterns on Mad in the episode "Lukewarm Bodies / Does Someone Have to GOa?" In their skit, the Lanterns appear on a reality show where they must decide which of their teammates will get fired from the corps. Eventually, the Lanterns narrow it down to Ch'p and Kilowog (who is confused at realising that Ch'p is even a member of the corps, assuming they simply had a rodent infestation). Ch'p ends up being the one to get fired, causing him to go into a fit of rage. He last says "Nuts to you! Nuts to you! Nuts to all of you!" before storming off. Ch'p has a speaking role in the original animated video, Green Lantern: First Flight voiced by David Lander. Ch'p appears in background shots in the original animated video, Green Lantern: Emerald Knights, which uses the same character designs from Green Lantern: First Flight. He is referenced in the film's final lines, where Hal Jordan mentions a previous mission where his only backup was a squirrel. Ch'p is featured in the Smallville Season 11 digital comic based on the TV series. ^ Duck Dodgers episode "The Green Loontern". ^ Green Lantern: The Animated Series: Season 2 Episode 2 "Reboot". ^ Green Lantern: The Animated Series: Season 2 Episode "Ranx". David Leonard Lander (born June 22, 1947) is an American actor, voice actor, comedian, composer, musician, and baseball scout. He has also worked as the Goodwill Ambassador for the National Multiple Sclerosis Society. He is best known for his portrayal of Squiggy on the sitcom Laverne & Shirley. He is the father of Natalie Lander. Doctor Ub'x is a fictional character in the DC Universe. He first appeared disguised as the villain Polestar in Green Lantern Corps #201 (June 1986), then disguised as the villains Truk, Malignon, and his true form in Green Lantern Corps #202 (July 1986). Ub'x was named after the famed Walt Disney animator Ub Iwerks. H'lven is a fictional planet in the DC Comics Universe. It is first mentioned in Green Lantern vol. 2 #148 (January 1982). The Kangas are a fictional species of kangaroos in the DC Multiverse. In Pre-Crisis continuity, Kangas were alien beings brought to Paradise Island by a tribe of star-faring Amazons who called themselves the Sky Riders of Nebulosa. The Amazons would ride on kangas for sport as well as using them to help with work on the island. Wonder Woman's Kanga was named Jumpa. This list of fictional rodents in comics is subsidiary to list of fictional rodents and covers all rodents appearing in graphic novelizations, manga, comic books and strips. The characters listed here include beavers, chipmunks, gophers, guinea pigs, marmots, prairie dogs, moles and porcupines plus the extinct prehistoric species (such as Rugosodon).